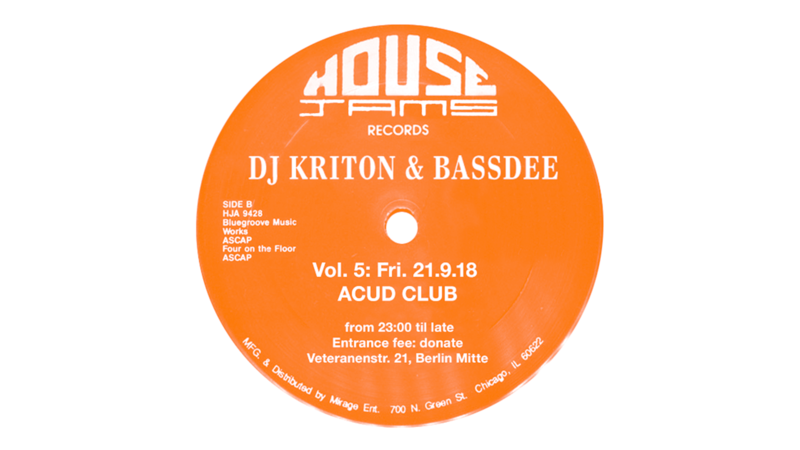 Kriton and BassDee are back to ACUD - this time inside the CLUB - with some very fine house music. … moved to Berlin in 1992 and became a vital member of the famous “Friseur Club”. He refined his DJ sets in numerous underground clubs in Berlin and in various clubs and venues in Europe and New York. In 2011 he became a founding member of Knuggles Recordings and started to produce tracks and remixes as one half of Homeless House. Until today DJ Kriton kept the vibe of house music alive and real. His mix is always inspiring and full of love and respect for the music, that he delivers with dance floor sophistication. Born in West Berlin BassDee got in touch with dance music in the late 80ies, a few years before the Berlin Wall came down. The G.I. Disco influences on the Kurfürstendamm Diskotheken, the engulfing Hip Hop movement and suddenly the Acid House wave aroused his inspiration to perform as a DJ. So he bought his first records at the PINKY record store, scratched together all his money to buy turntables to win the first merits in the science of mixing. The year 1989 changed his world inconceivably, when Monika Dietl was performing the best Dance Music Show at the West Berlin SFB 2 radio station, DJ Jon Magic Jonzon was spinning eternal house sets at the Berlin UFO Club, and the newly opened Hard Wax record store supplied unknown House Music from Chicago, Detroit and New York. BassDee´s first DJ club gig was at a Dubmission Party in 1991. In 1992, he started the Bassterror Project focussed on Breakbeat together with his brother DJ Feed and Alec Empire, while at the same time playing House and Techno at legendary clubs like the Berlin ELEKTRO (Resident), Friseur (Resident) or Tresor, and the Potsdam Waschhaus, where the Hard Wax DJs René and Pete shaped the probably most futuristic techno nights of that time. The enormous power of the breakbeat science hidden in the the big 1994 Jungle boom fueled things even further. In 1994 he started the admired Drum&Bass show “Radio Massive” together with Thaddeus Hermann at the Berlin Kiss FM station. His next major project was the Case Invaders record label initiated with DJ Bleed. Beside his residencies at the Berlin WMF, Elektro, Friseur, Toaster and Icon he dejayed at the same time in Berlins Clubs like 103, E-Werk, Maria, Ostgut, Cookies, Suicide, amongst others. As one of the creators of the famous Berlin “hard:edged” nights, he tremendously shaped Berlin’s Drum&Bass scene. Since Drum&Bass somehow lost its edge, he found his way back to the enthusiastic embrace of House and Techno and returned with full enthusiasm to the Berlin club scene playing at places such as the Panorama Bar, about:blank, Prince Charles, Gretchen, Horst Krzberg, WMF, M12. BassDee recently joined the Hidden Hawaii crew and co-produced the critically acclaimed Veteranenstraße EP together with Felix K.